No need to feel intimidated that you won’t be able to get your stickers installed after they arrive. If we don’t feel the conditions are perfect for what you want to accomplish, we’ll let you know before quoting. When it comes time to install your stickers, we’ll walk you through the installation process step by step over the phone or e-mail. Our hands on process of quoting and knowledgeable staff will ensure your project goes up smoothly. Our Large Format Stickers are printed at 720dpi on the latest wide-format printing technology to ensure amazing full color prints and nice, rich solid colors. 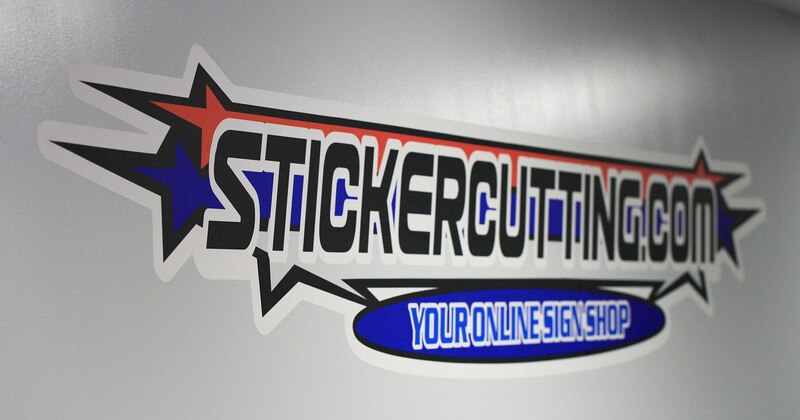 Our high-tech in house cutting ensures your stickers are cut perfect every time. After you submit your artwork to us, we double check your artwork that it’s high enough resolution for a large format print. Once we confirm your artwork is perfect for printing, we’ll return a quote to you the same business day. After we print your stickers onto the material options above, we can cut your stickers to nearly any outside shape. You can draw in the line to show us where you would want them cut, or simply let us know the shape you prefer. Be sure to let us know where your stickers will be applied so we can ensure you’ve selected the best material for the job. If you have many vehicles that need to be labeled, we’re able to produce these from one or two to 100+ if needed. Our Large Format Vinyl Stickers are perfect for a vehicle, indoor wall, outdoor sign or covering up an old worn surface. Our stickers can transform a bare piece of metal into a functional sign or turn a bland company vehicle into a rolling billboard! Indoor Wall Stickers – Select our Removable Wall Graphic Material – Removable and Reusable. We’ve helped our customers apply them in their offices, bedrooms, and even their bathrooms. Outdoor Signage – Select any material but Removable Wall Graphic Material – Many of our customers rely on us to provide the vinyl stickers needed to turn their bare painted metal into a working sign, at significant cost savings. Vehicle Stickers – Select any material but Removable Wall Graphic Material – From labeling a tailgate to covering a door, we can print your artwork to make your vehicle into the billboard it should be. Office Branding – Select our Removable Wall Graphic Material or Laminated White Vinyl – Cover the bland and basic surface with a glossy, durable vinyl sticker – add that professional branding flare to your work space. + Laminated White Vinyl – Our standard film, great for smooth surfaces like metal or glass, has a glossy finish. Apply to signs, truck doors, trailers, almost any surface that is smooth and clean. + High Tack Laminated White Vinyl – Great for slightly rough or hard to stick surfaces, has a glossy or matte finish. + Laminated Reflective Vinyl – Ensures maximum visibility at night, glows in full color at night like the graphics on an emergency vehicle. Glossy appearance during the day, incredible night time glow effect, perfect for vehicle doors, signs, or any relatively flat surface. + Wall Graphic Material – Made for interior wall applications. Printed with a white or colored background. Easily removable, can be removed and reapplied without any damage, has a matte finish when printed. Very easy to install. We recommend designing your file at 150 dpi at full printed size, or designed at half the printed size and saved at 300 dpi. Files can be designed in full color utilizing CMYK or RGB colors, do not design using pantone or spot colors. Vector Art designed in Corel Draw or Adobe Illustrator is highly recommended (.EPS, .AI, .PDF) and may be required. Other file types we utilize are .PNG, .JPG, and .PDF if designed in Adobe Photoshop. For most Large Format Stickers, we can produce as little as 1 sticker, smaller sizes around 12″ x 12″ may require a 5 quantity minimum depending on size and needs. We recommend using our Free Quote form with your needs and we can see what’s available for your project. Need your stickers faster? Contact Us. We may be able to help! Our cutting options are one of the most flexible in the industry, with limitations that are nearly limitless and cutting precision that’s simply amazing. We have the ability to cut every standard shape and basically any shape that you can draw in Adobe Illustrator. The limitations come in with the materials we’re cutting and ensuring your stickers will apply nicely and stay applied. Start with our Free Quote form and submit what you need produced and we can check out your project first hand! Large Format Stickers require artwork that is vector (.eps or .ai) or very high-resolution files that were designed for large format printing. For non-vector files (.jpg, .png formats), files should be designed at at least 300dpi at 100% size that you need the sticker printed in. For ultra-large files over 30″ in 30″ in size, you may be able to save at a lower dpi to save on file size.